Since then Mali has developed her own ideas about Jewish Peoplehood, based on her experience as a community shlicha (emissary) in Toronto, Canada, and now in her work on leadership at the Jewish Agency in Jerusalem. 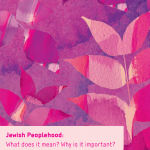 Her concepts of Peoplehood versus Neighborhood offer a fruitful model for thinking about contemporary Jewish identity, and her article on this topic is now available in the CJPE digital library. “The model is based around two poles; neighborhood and peoplehood. The neighborhood pole describes Jewish identity that is based in local networks of belonging. It is about the connections you make because of the specific place you live, and it is about friends who share similar interests and needs. The other pole is that of the global people. This is the sense of connectedness to people you have never met and don’t know personally, who may live on the other side of the world and who have very different cultures or life situations. But they are connected by ties of history, of shared fate, of mutual responsibility. And, contrary to much of the way the Jewish community operates, these poles of Jewish identity are not a zero-sum game. Rather, it is critical that Jewish identification today incorporate both the local and the global. The viability of the Jewish world hinges on the understanding that identity has to exist and interchange at the same time on two levels. And we need both poles because they mitigate against the losses of the other. In other words, with just the global level of identification, we become dislocated from the regular practical application of Jewish life. And with an over-concentration on the local we retreat into closed-minded silos that reinforce competition and separation. I also believe that because Jews are actually NOT all the same – but have diverse languages, customs, beliefs, backgrounds etc., – we don’t have to go outside the Jewish world to find the Other any more. We can learn about ourselves by encountering ourselves who are different and yet the same. In the past, the assumption was that non-Jews were the Other, but now we can do cosmopolitan too. The Other can be ourselves, so what is magical in an educational sense is to find the other in ourselves. And in a social world, the networks that help us do this are really valuable”. Based on all these ideas, Mali is building a framework for training Jewish leaders who can lead in the both their local neighborhood and the global Jewish arena. She hopes to integrate these ideas into new ways for developing the Jewish People of the future. What do you think of these ideas? How do you see dual polarity of neighborhood and peoplehood played out in your Jewish environment? Do you find that one is privileged over the other? In what ways are Jews the same and yet different? And who is the Other that you expose your learners or constituents to? We’d love to hear your thoughts! Sarah Mali is the Director of the Global Leadership Project and Machon Le’Madrichim at the Jewish Agency for Israel. Her work on Jewish People Leadership was supported by the Jewish Agency for Israel and UJA Federation of Greater Toronto.